Description: Weidenfeld and Nicolson , 1986: cream hardcover with gilt lettering to spine: approximately 225 x 275 mm tall: , monotone map, 95 pages of black and white and coloured plates. Synopsis: A collection of Lord Snowdon's photographs produced during a five-day visit to Israel in 1985, when he travelled from Beersheba in the South to the Northern Golan Heights. A foreword by John Mortimer precedes a vivid and eclectic mix of the artist's impressions of people and places encountered en route. Condition: Small repairs to dust jacket edge, and with price flap intact but creased: hardcover and contents very clean and good: overall clean, firm and good. 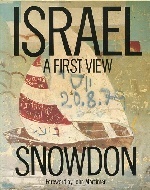 Mary Ward Books is an independent online bookstore specialising in second hand, out of print books and used books such as Israel A First View by Snowdon Foreword by John Mortimer. We offer a book search facility and secure payments via PayPal and Nochex. Mary Ward Books is based in East Anglia, United Kingdom. We were established in 1997 and have been selling books online since 2002. We ship worldwide, please click here to see our shipping charges for Israel A First View by Snowdon Foreword by John Mortimer.